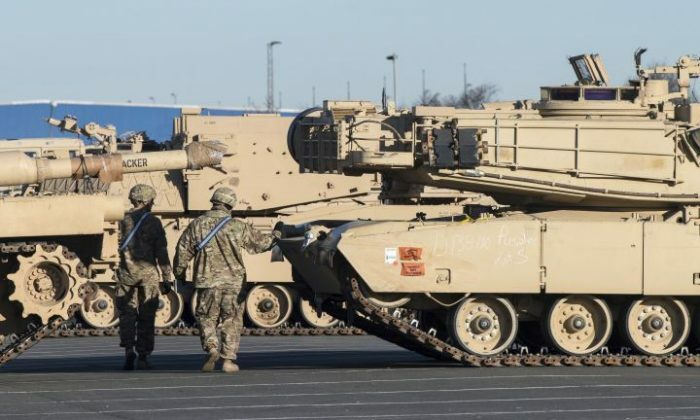 U.S. tanks arrived in northern Germany on Friday in the largest American tank shipment since the collapse of the Soviet Union in 1989. The BBC reported the first of 87 tanks and 144 military vehicles were unloaded in Bremerhaven, Germany, last week. Around 3,500 troops are also slated to be deployed around the eastern reaches of NATO’s territory. The deployment is intended to quell fears of potential Russian aggression in eastern Europe amid tensions between NATO states and Moscow. On Monday, the U.S. combat brigade arrived in Germany and began rolling east toward Poland, CBS News reported. In Poland, the military hardware will be sent to staging sites across the country, Stars and Stripes reported. Other NATO members are also boosting their presence in eastern Europe: The United Kingdom sent fighter planes to the area of the Black Sea, and troops, light armor units, and tanks were sent to Estonia, according to the BBC. France and Denmark will also back the U.K.’s forces, while Germany will send forces to Lithuania. Russian President Vladimir Putin derided the American and NATO buildup, saying it’s a pointless endeavor. He said it’s “stupid and unrealistic” to think Russia would attack anyone in Europe—nearly three years after Russian-backed forces took over the Ukrainian territory of Crimea, CBS reported. The U.S. also plans to move in a combat aviation brigade with about 10 Chinook and 50 Black Hawk helicopters and 1,800 personnel from Fort Drum, New York, and a battalion with 24 Apache attack helicopters and 400 personnel from Fort Bliss, Texas. They’ll be headquartered in Germany with some aircraft positioned in Latvia, Romania and Poland, AP reported.